A teacher affects eternity and can never tell where the influence stops. It is this influence that will guide these children and shape their lives, what they know and how they apply it. This will impact all the people they work with, are friends with and their future children. That is an enormous responsibility that should be rewarded and celebrated. Teachers in the Simi Valley Unified School District affect our students lives every single day. Simi Valley Education Foundation, with the help of many community businesses, is honoring teachers with the Teacher of The Month (TOTM) program. Each month a teacher is rewarded for their dedication and contribution to the students in our community. The recipient teacher is given a basket full of goodies donated by local businesses. SVEF would like our community to get to know our wonderful teachers so we will be featuring the TOTM winners on our blog. Our first teacher for the 2017-2018 school year is Gayle Pinkston of Arroyo Elementary School. 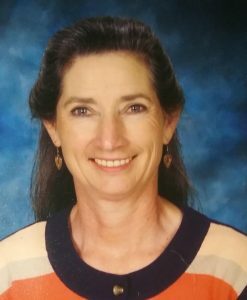 Gayle Pinkston is a teacher at Arroyo Elementary school who has a passion for what she does. She has been teaching for 28 years and has been with Simi Valley Unified School District since 1989! She has a Master’s degree in Curriculum & Instruction and a Doctorate degree in Education Leadership. During her career, she has been awarded the FMF Teacher Program where she spent 3 weeks in Japan immersed in their education system and culture. She also spent a week at Dryden Flight Research Center through NASA Educational Workshop experiencing scientific inquiry. She is able to bring these experiences to Simi Valley students every single day! Gayle Pinkston is a treasure in our community and we are honored to have her as our September Teacher of the Month. A thank you to these local businesses for contributing to TOTM by providing a gift to our wonderful honorees. Ali Baba Café, Cal State Channel Islands, Grand Canyon University, Harley’s Bowl, Iverson Construction, Lazertag Extreme, Massage as Art, Simi Valley Auto Spa, Simi Valley Cultural Arts Center, Studio Movie Grill, Kevin and Sandra Underwood, Ventura County Credit Union and YMCA.Ali Baba Café, Cal State Channel Islands, Grand Canyon University, Harley’s Bowl, Iverson Construction, Lazertag Extreme, Massage as Art, Simi Valley Auto Spa, Simi Valley Cultural Arts Center, Studio Movie Grill, Kevin and Sandra Underwood, Ventura County Credit Union and YMCA. Ali Baba Café, Cal State Channel Islands, Grand Canyon University, Harley’s Bowl, Iverson Construction, Lazertag Extreme, Massage as Art, Simi Valley Auto Spa, Simi Valley Cultural Arts Center, Studio Movie Grill, Kevin and Sandra Underwood, Ventura County Credit Union and YMCA. Copyright © 2019 Simi Valley Education Foundation. All Rights Reserved.